Zirconium atoms have 40 electrons and the shell structure is 2.8.18.10.2. The ground state electronic configuration of neutral zirconium is [Kr].4d2.5s2 and the term symbol of zirconium is 3F2. Zirconium: description Your user agent does not support the HTML5 Audio element. Zirconium is a greyish-white lustrous metal. The finely divided metal can ignite spontaneously in air, especially at elevated temperatures. 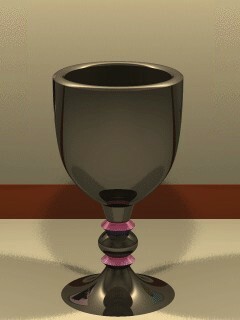 The solid metal is much more difficult to ignite. The inherent toxicity of zirconium compounds is low. Hafnium is invariably found in zirconium ores, and the separation is difficult. Commercial grade zirconium contains from 1 to 3% hafnium. The hafnium is removed from the zirconium used in the nuclear power industry. Zirconium is found in S-type stars, and has been identified in the sun and meteorites. Analyses of lunar rock samples show a surprisingly high zirconium oxide content as compared with terrestrial rocks. Some forms of zircon (ZrSiO4) have excellent gemstone qualities. 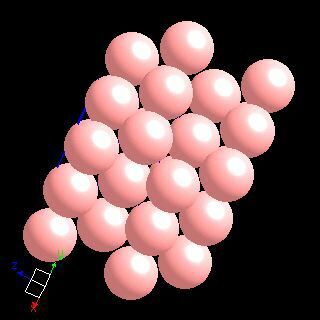 The image above is a virtual representation of zirconium metal calculated by Patrick Callet using the complex diectric function of the element only. The solid state structure of zirconium is: bcc (body-centred cubic). Zirconium has no biological role. The tolerance of human tissues to it makes the metal suitable for some artificial joints and limbs. Reactions of zirconium as the element with air, water, halogens, acids, and bases where known. Binary compounds with halogens (known as halides), oxygen (known as oxides), hydrogen (known as hydrides), and other compounds of zirconium where known. Bond strengths; lattice energies of zirconium halides, hydrides, oxides (where known); and reduction potentials where known. Zirconium was discovered by Martin Heinrich Klaproth in 1789 at Berlin, Germany. Origin of name: from the Arabic word "zargun" meaning "gold colour". 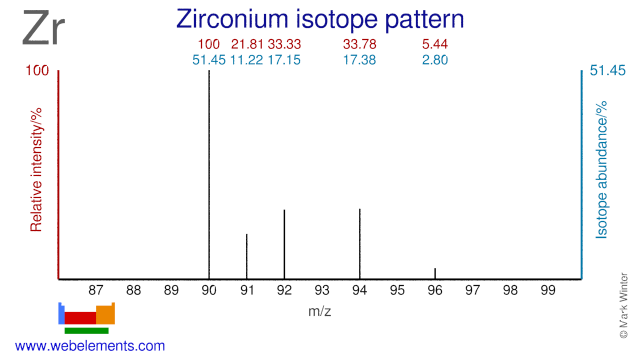 Isotope abundances of zirconium with the most intense signal set to 100%. Zirconium has five stable isotopes, of which a few are used for the production of radioisotopes. Although radioactive Zr-95 is a fission product, it can also produced by neutron irradiation of Zr-94. Zr-96 has been used for the production of the radioisotope Zr-97. Zr-90 can be used for the production of the PET isotope Nb-90. Finally, Zr-90 has been proposed for cladding in nuclear fuel. The use of Zr-90 would lower even further the already low neutron absorption cross section of natural Zr that is currently used as fuel cladding. Isolation: zirconium is available from commercial sources so preparation in the laboratory is not normally required. In industry, reduction of ores with carbon is not a useful option as intractable carbides are produced. 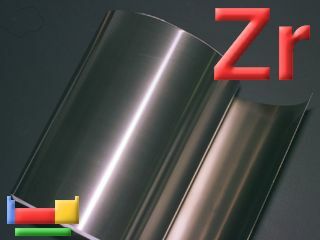 As for titanium, the Kroll method is used for zirconium and involves the action of chlorine and carbon upon baddeleyite (ZrO2). The resultant zirconium tetrachloride, ZrCl4, is separated from the iron trichloride, FeCl3, by fractional distillation. Finally ZrCl4 is reduced to metallic zirconium by reduction with magnesium, Mg. Air is excluded so as to prevent contamination of the product with oxygen or nitrogen. Excess magensium and magnesium dichloride is removed from the product by treatment with water and hydrochloric acid to leave a zirconium "sponge". This can be melted under helium by electrical heating.